Vintage Marshall tones that lean toward the classic JTM45. Light, medium, and high gain overdrive at its best. From Hendrix to AC/DC, you will be right at home. A specially designed three band EQ allows you to sculpt it perfectly into any rig. If you’ve ever heard an original Marshall JTM45 than you know why it’s the voice of classic rock & roll. The classic JTM45’s are loaded with warm, rich character that makes a Stratocaster sing and a Les Paul scream. Our Charlie Brown is voiced to transform any good amp into a living, breathing replica of the tone that built an era. The Charlie Brown V4 builds on the popularity of the V3 by keeping the same heart and soul while giving more flexibility and options. Let’s take a look at the controls. Looking at the pedal you see Volume, Drive, Bass, Mids, and Treble. The Volume control acts as a master volume would on your amplifier. Turn this control up and you are louder, turn it down and you are quieter. The Drive knob controls the amount of dirt or overdrive in the path. All the way up is the most available dirt, all the way down is the cleanest setting. With the gain below 50%, it is a low gain grit overdrive that even Hendrix would be proud to turn on. When you get into the upper half of the gain control, you will find a new world of natural, crunchy bite that stands alone in our line of overdrives. Max it out and you will be in high gain overdrive heaven. 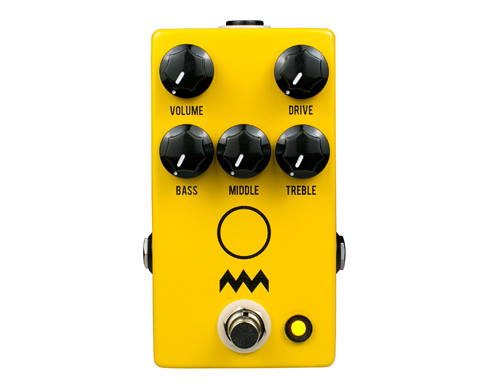 New to the V4 are the Bass, Mids, and Treble controls. To faithfully replicate a vintage Marshall, we felt it was time to incorporate a full Marshall style tone stack. All three of these controls act as a cut and boost, while at noon they are relatively flat. The right 1/4″ jack is the input, and the left is the output. If you are looking for classic rock overdrive that feels, sounds, tastes, and smells like the real thing… Look no further. This pedal requires standard 9V DC Negative power, consumes less than 100mA, and measures 2.2″x4.3″x1.5″.